So I'm much better and have been able to craft again so I have created this super cute card using a couple of Whimsy images. challenge this month at Whimsy is more than one image. This challenge was a little harder than it seems, to put 2 images on a card and make them compliment each other. I think I was able to accomplish this using 2 wonderful digital images from StampArt Design. The first Image is called Owl-ways thinking of you this includes the sentiment. The second image is Owl-Ways Winter. 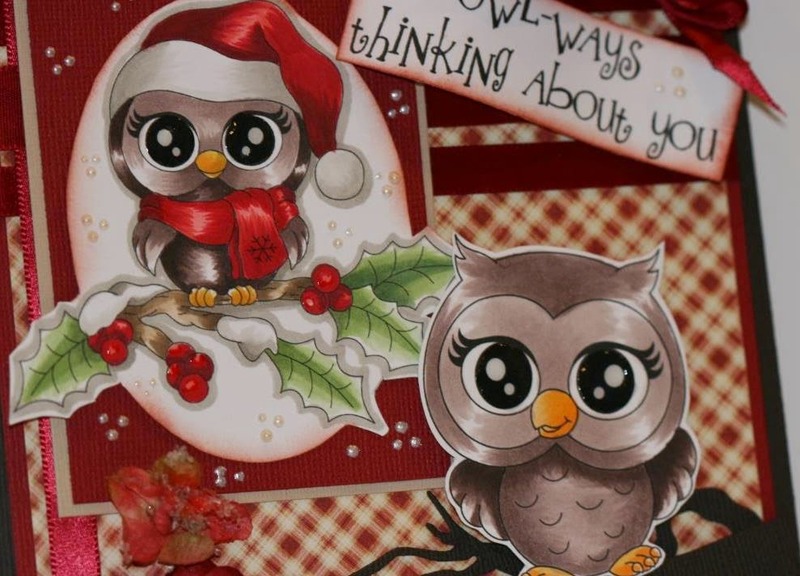 Its hard to see in the photo but I popped up the front owl sitting on the branches to give my card some dimension. So make sure you make a creation and put it on the Challenge this month at Whimsy for a chance to win some great digital images from the Whimsy Store. Or at least hop over by clicking here to check out the wonderful creations from the digital designers. This is wonderful!!! Love those owls!! Love your colors!!! Just absolutely Gorgeous!! !